In New Year Holidays, we had parties with my family members and relatives. We paid this year's first visit to the shrine. And one of the important events of Japan's New Year days is Hakone relay marathon Ekiden! Ekiden is an athletic sports born in Japan. Each runner of the group wearing a sash runs a certain distance and passes over the sash to next runner instead of baton. Hakone Ekiden is the most famous ekiden. 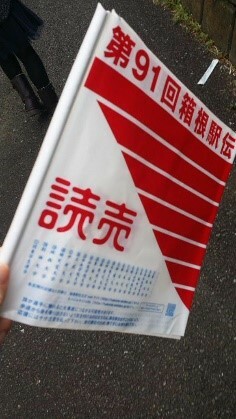 Universities qualified to run the Hakone Ekiden compete to win the fastest among Japanese universities. Every year, on the second and third of January the competition is taken place. 107.5 km from Tokyo to Hakone in Kanagawa prefecture on the first day and next day, 109.6 km from Hakone to Tokyo. There are ups and downs since Hakone is a mountain district. Each day, 5 runners from one university, totaling 10 runners participate in the race. Every year I go to cheer the race since my grandmother lives just in front of the Ekiden route. Of course, I went there in this New Year holidays as usual. Flags are given to the race watchers, so everyone standing beside the road cheered the runners shaking the flag. It is a great fun to watch the race by the roads feeling sense of unity with other cheering race watchers. Please try watching Japan's Hakone Ekiden if you have a chance!